Providence, RI (12/22/2010): The American Hockey League is mourning the passing of Harry Pidhirny, one of the league’s all-time greats and a member of the American Hockey League Hall of Fame’s incoming Class of 2011. Pidhirny passed away on Monday after a battle with cancer. He was 82. A native of Toronto, Pidhirny played 1,071 games over 17 seasons in the American Hockey League with the Philadelphia Rockets, Springfield Indians, Syracuse Warriors, Providence Reds and Baltimore Clippers. 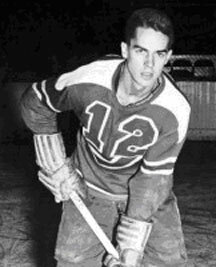 He scored at least 20 goals in 12 consecutive AHL campaigns from 1949-61, and on Nov. 21, 1953, he tied an AHL record by scoring six goals in one game. Pidhirny played in five AHL All-Star Games during the 1950’s and won Calder Cup championships in Springfield in 1960 and 1961. Pidhirny, who five times in his career played in every one of his team’s games in a season, ranks third in AHL history in games played, sixth in goals (376) and seventh in points (829). He was a member of the first class of inductees into the Springfield Hockey Hall of Fame in 1996, and will be inducted into the AHL Hall of Fame at this year’s ceremony in Hershey, Pa., on Jan. 31. Harry Pidhirny (1928-2010) in the Reds uniform.